We are looking for original works for the possibility of production in 2015! Owl Tree is a Cary NC based independent theater company dedicated to producing originals unseen, unknown and unconventional. 2015’s theme for original productions is : “The Year of Ghosts” We are looking for full length plays that explore the emotions, people and memories that can haunt us. We’re not just looking for conventional ghost stories...but also plays about “the ghosts” that we carry around in our day-to-day lives. Plays we like to produce have characters in the midst of dynamic choice-making & transformation. We like stories that provoke audiences in re-evaluating themselves & their world. These works can not have any PREVIOUS PRODUCTIONS. The script must not exceed a cast of 8 actors. a cast composed of adults and young adult actors. More young adults than adults. We need 2 copies of all submissions. One with author information & one WITHOUT author information! Submissions deadline SEPTEMBER 15, 2014! 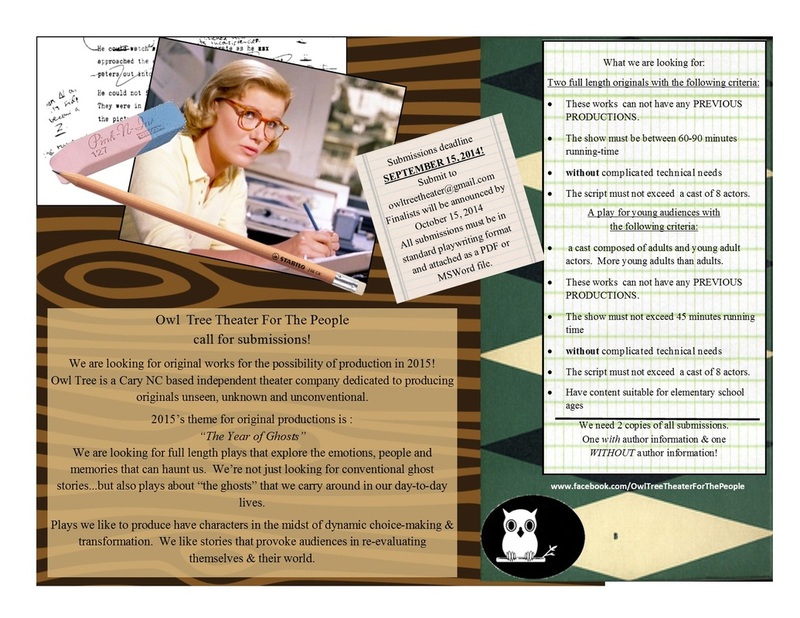 Submit to owltreetheater@gmail.com. Finalists will be announced by October 15, 2014. All submissions must be in standard playwriting format and attached as a PDF or MSWord file.